POTC week with the Blu-ray exclusive release. $61 million for all of Blu-ray that week. I was thinking about $30 million and you were thinking about $35. 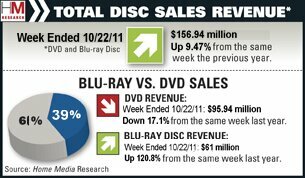 All of Blu-ray did $61 million, which is VERY low based on back of the napkin projections I saw. What is interesting is that OD as a whole as up 9.47% If Disney would have done a typical release, the week would have probably been one of the strongest YoY weeks for OD this year. What was the comparison like last year (box office lead-in)? Last edited by bruceames; 10-31-2011 at 06:41 PM.. Reason: oops. meant to quote post, not to edit. Wow, $61 million is really bad considering Pirates was Blu-ray exclusive. I would have thought $80 disappointing as well. Yeah, it probably was more like $30 for Pirates and $31 for everything else (maybe even less than $30 for Pirates). Of course, The-Numbers is going to report a huge week and be close to $100 million for the top 10. What a joke. The-Numbers is a joke. It should be obvious by now. Last year was crap by comparison. Only $56 million among 2 titles. POTC4 week was $373 million. So you have nearly a 7:1 ratio of box office power in your favor, PLUS Pirates 4 exclusive to Blu-ray, and YoY is up only 120%. I honestly thought it would be up at least 300%. OD up 9.47% is not impressive at all considering YoY box office power. With that kind of box office disparity, OD performance was VERY weak. My guess is this week would have been way more impressive with a DVD release. We will have to wait to see if the DVD sells in a few weeks, but right now it didn't really do much to spur Blu-ray sales. I think it is safe to say the consumer has spoken and said it is too soon to try and go BD only. Yes, the BD exclusivity really hurt OD. It may catch up some when the DVD gets released next month though. Although it'll be impossible to know by how much unless Disney releases sales figures, which is unlikely. This was significant enough that it may get asked during their Q4 earnings call. I know Toy Story 3 was discussed much last year, particularly how poor the conversion rate was compared to what OD did 3 years ago. If this experiment results in a significant decline in conversion, it may get discussed. I can't wait to here what Iger has to say. He has to tell it the way it is. No sugar coating. Iger generally has been good about being clear about the issues with Home Video. He is the one who honestly pointed out the decline in new release performance, calling the decline in conversion rates "sobering". That gap in Q4 box office is amazing! Blu-ray obviously wasn't up to the task of carrying a mediocre title exclusively, and one that's priced at $23-25 to boot. POTC4 is no Lion King, and consumers in general will only go above the $20 threshold if it's a really good movie. POTC4 doesn't qualify. They would have had more success with Cars 2, even though that's by far the worst Pixar movie ever made. They also should have had it at an SRP so it could have been street priced at under $20. So I think a big part of the problem is that Disney's releasing some big duds this fall, and it's not all Blu-ray's (or DVD's) fault.